At 3pm Nashville time on Thursday, June 12, the World Cup begins in Brazil. 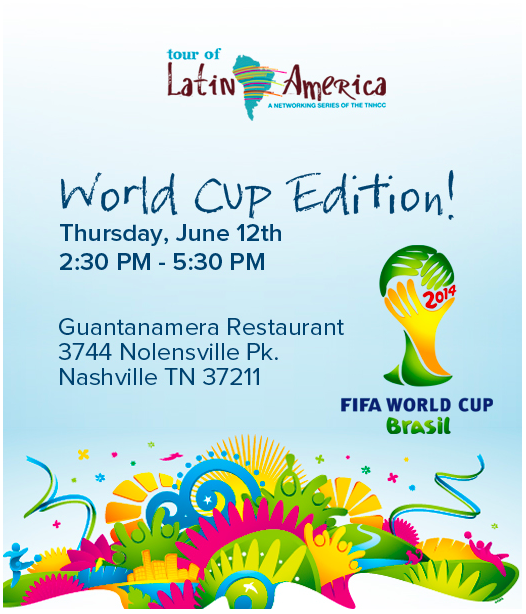 Middle Tennesseans can watch the opening match, Brazil-Croatia, at a viewing party at Guantanamera Restaurant, at 3744 Nolensville Pike, near the entrance to the Nashville Zoo. The party starts at 2:30pm and will be hosted by the Tennessee Latin American Chamber of Commerce. A finger food buffet, live music, and mojitos await attendees. Admission is $35 ($30 for TLACC members) and includes unlimited access to the buffet and two drink tickets. "The World Cup is the biggest and greatest sports event in the world celebrated every four years. When 32 countries come together in one location to celebrate one sport we must take notice. Every four years Latinos from all over the world gather around a TV set to see their team/country play in the World Cup, if our team didn't qualify we pick our next top choice and when or if that team is disqualified we cheer for our "mother-land", Spain. The tradition is handed down from generation to generation, the World Cup is a must watch event. This year we the, Latin American Chamber of Commerce will celebrate this tradition with passionate seasoned soccer lovers and spectators alike, we will cheer, yell, applaud and possibly cry. It was important for us to offer this viewing party in a location that reminds us of being home, Guantanamera Restaurant, offers that taste of home in South Nashville. We hope to continue to celebrate our culture and traditions in our new home city and we hope to convert spectators into fans." -Marcela Gomez, VP of the Board of the Tennessee Latin American Chamber of Commerce. Read a glowing review of Guantanamera in the Nashville Scene, here.